Start out with an simple pattern. Type in whatever you want. Fill in that text with the same pattern you used for the background. You can't see it here but its there. 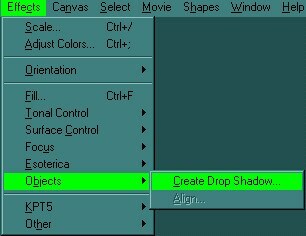 Now, while the text is selected, create a drop shadow. Use these settings, or tweak them and experiment. And there's the shadow you just made. Move the shadow up so that its just a little below the original text. Copy and paste that shadow, then make it negative. Send that white shadow to the back while keeping it a little higher than the original text and there you have it!